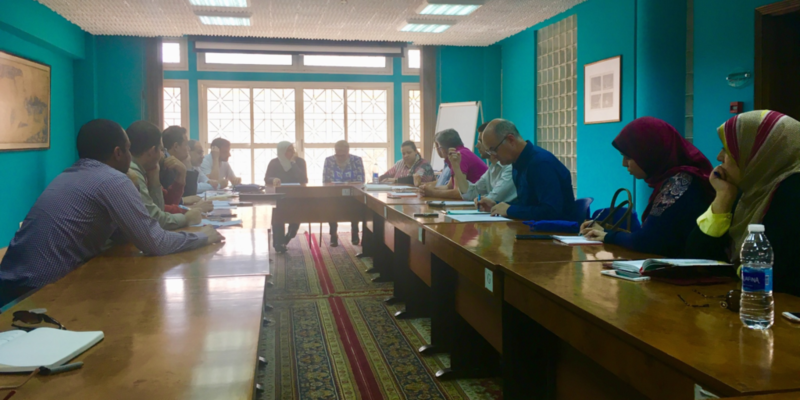 For this new session of our joint seminar between Al-Azhar and IDEO, we chose to comment on the same text, in order to highlight the processes of interpretation we use and to exchange our approaches. We chose an extract from a text by Ibn Taymiyya, which was commented on by three researchers: Adrien Candiard, OP, IDEO member, Mrs. Héba El-Zéftaoui, Assistant Professor, Mr. Ziyad Farrouh, University lecturer. Ibn Taymiyya (d. 728/1328) is an extremely prolific writer who spent his life writing treatises and fatwās, most of which violently attack the scholars of his time, especially the Shiites, the Christians, and the Sufis of the school of Ibn ʿArabī (m. 638/1240). Ibn Taymiyya, a man of keen intelligence, criticizes the Muslim tradition for not having achieved any definitive result in achieving knowledge of God, but rather engage in scholastic conflicts and fantasies about God. In the long introductory fatwā to his book Darʾ taʿāruḍ al-ʿaql wa-l-naql, Ibn Taymiyya offers a justification for the human possibility of being able to speak about God, as well as a rational method so as to not going astray. He, at the same time, differs from the Ašʿarites, represented by Faḫr al-Dīn al-Rāzī (d. 606/1209), who always defer reason (ʿaql), and the Ḥanbalites, of which he himself was a disciple and who are represented, for example, by Ibn Qudāma (d. 620/1223), who always defer to tradition (naql). He criticizes the idea that one has to choose between the two. Human reason and revealed tradition are not in opposition. Rather, they must be able to express the same truth about God. The epistemological way explored by Ibn Taymiyya is based on the principle that the only sure and true thing is God himself, that He reveals His word in a rational way which is accessible to human intelligence. Moreover, since God is transcendent, none of our human methods of logical analysis apply to him, and rather than using syllogism (qiyās šumūl) or analogy (qiyās tamṯīl), Ibn Taymiyya describes the method he finds at work in the Qurʾān and the hadiths: the “Eminence way” (qiyās awlā), according to which we can attribute to God all perfections. In doing so, it goes beyond the debate over divine attributes, between unicity (the attributes of God are analogous to human attributes) and equivocity (divine attributes have no relation to human attributes). More fundamentally, Ibn Taymiyya rejects any reasoning that would be a pure logical game of language. He finds it more certain to start from the revealed given (i.e. the Qurʾān and Ḥadīṯ), and then build logical reasoning. In other words, he is nominalist: he refuses to confuse mental realities and reality itself, and criticizes theologians, rationalists, or traditionalists who believe that the fruit of their rationalization express some reality about God. Essentially, we can say that Ibn Taymiyya built analogies based on the revealed text and not on the “eternal” truths elaborated by the human mind. The three presentations emphasized different points, historical or theological. The discussion demonstrated that Ašʿarism, which is the official school of theology followed by al-Azhar, has developed, and that the attacks of Ibn Taymiyya in the fourteenth century are not always relevant today. However, all theological schools are taught at the university in the theological faculties, and not just Ašʿarism. The question with which we closed our discussions was that of the place of faith between reason and tradition. This will be the topic of our next meeting at the end of April.